Join Us!!! We are looking for someone to help us cover Qatari basketball. Please send us an e-mail. Here is the last round review presented by ESL. The game had a very big importance for second-ranked Al Shamal as it allowed them to take a leadership position. Al Shamal defeated bottom-ranked Al Rayyan in Doha 86-74. Al Shamal looked well-organized offensively handing out 26 assists. Algerian forward Mohamed Harath (198-90) stepped up with a double-double by scoring 27 points, 18 rebounds and 4 assists for the winners and Georgian point guard Giorgi Tsintsadze (192-86) chipped in 17 points and 10 assists. The best for the losing side was American point guard TJ Bannister (180-84, college: Liberty, agency: Inception Sports) with a double-double by scoring 16 points, 5 rebounds and 11 assists. Al Shamal (8-1) have an impressive series of six victories in a row. As mentioned above they are alone now at the top position. Al Rayyan at the other side still closes the standings with nine games lost. 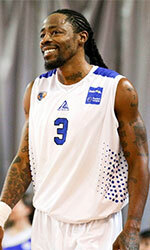 Very significant was Al Arabi's (#5) 21-point road victory against 6th ranked Al Gharafa 87-66. It ended at the same time the two-game winning streak of Al Gharafa. Senegalese center Oumar Seck (208-88) nailed a double-double by scoring 28 points, 11 rebounds and 6 assists for the winning side and Courtney Pigram accounted for 20 points, 6 rebounds and 5 assists. American guard Franklin Session (187-89, college: CS Los Angeles) came up with 31 points and 8 rebounds for Al Gharafa in the defeat. Defending champion maintains fifth place with 5-4 record. Al Gharafa at the other side keeps the sixth position with five games lost. The game in Al Khor was also quite interesting. Third ranked Qatar Sports Club (7-2) played at the court of 8th ranked Al Khor (1-8). Qatar Sports Club did not have too big problems and got a relatively easy victory 92-74 on Tuesday. The best player for the winners was Jeff Newberry who scored 26 points and 9 assists. At the other side the best for losing team was Ameer Jackson who recorded 30 points, 8 rebounds and 8 assists. The victory was the seventh consecutive win for Qatar Sports Club. They maintain third place with 7-2 record behind leader Al Shamal. Al Khor lost their fourth game in a row. They keep the eighth position with eight games lost. The game in Doha was also worth to mention about. Fourth ranked Al Wakrah (6-3) played at the court of 7th ranked Al Ahli (2-7). Al Wakrah managed to secure a 5-point victory 73-68. It was a good game for DaQuan Brooks who led his team to a victory with 18 points, 6 rebounds and 7 assists. Al Wakrah maintains fourth place with 6-3 record. Al Ahli lost their fifth game in a row. They keep the seventh position with seven games lost. The most impressive stats of the last round was 17 points, 5 rebounds and 9 assists by Julius Coles of Al Ahli. The game had a very big importance for second-ranked Al Shamal as it allowed them to take a leadership position. Al Shamal defeated bottom-ranked Al Rayyan in Doha 86-74. Al Shamal looked well-organized offensively handing out 26 assists. Algerian forward Mohamed Harath (198-90) stepped up with a double-double by scoring 27 points, 18 rebounds and 4 assists for the winners and Georgian point guard Giorgi Tsintsadze (192-86) chipped in 17 points and 10 assists. The best for the losing side was American point guard TJ Bannister (180-84, college: Liberty, agency: Inception Sports) with a double-double by scoring 16 points, 5 rebounds and 11 assists and the other American import Lenny Daniel (203-87, college: CS Northridge) scored 20 points and 8 rebounds. Both teams had four players each who scored in double figures. Al Shamal (8-1) have an impressive series of six victories in a row. As mentioned above they are alone now at the top position. Al Rayyan at the other side still closes the standings with nine games lost. The game in Al Khor was also quite interesting. Third ranked Qatar Sports Club (7-2) played at the court of 8th ranked Al Khor (1-8). Qatar Sports Club did not have too big problems and got a relatively easy victory 92-74 on Tuesday. Qatar Sports Club looked well-organized offensively handing out 28 assists comparing to just 13 passes made by Al Khor's players. The best player for the winners was American guard Jeff Newberry (188-92, college: Oklahoma St.) who scored 26 points and 9 assists. His fellow American import forward Toney McCray (196-89, college: Nebraska) chipped in 24 points, 7 rebounds and 4 assists. At the other side the best for losing team was American point guard Ameer Jackson (193-94, college: Winston Salem) who recorded 30 points, 8 rebounds and 8 assists and Aladji-Bobo Magassa added 19 points and 11 rebounds respectively. Both teams had four players each who scored in double figures. The victory was the seventh consecutive win for Qatar Sports Club. They maintain third place with 7-2 record behind leader Al Shamal. Al Khor lost their fourth game in a row. They keep the eighth position with eight games lost. Very significant was Al Arabi's (#5) 21-point road victory against 6th ranked Al Gharafa 87-66. It ended at the same time the two-game winning streak of Al Gharafa. Al Arabi dominated down low during the game scoring 70 of its points in the paint compared to Al Gharafa's 38. Their players were unselfish on offense dishing 27 assists comparing to just 12 passes made by Al Gharafa's players. Al Arabi brought some defensive toughness making 10 blocks. Senegalese center Oumar Seck (208-88) nailed a double-double by scoring 28 points, 11 rebounds and 6 assists for the winning side and American guard Courtney Pigram (185-85, college: E.Tenn.St.) accounted for 20 points, 6 rebounds and 5 assists. Four Al Arabi players scored in double figures. American guard Franklin Session (187-89, college: CS Los Angeles) came up with 31 points and 8 rebounds and the other American import forward Nick Stover (198-93, college: S.Alabama) added 16 points and 10 rebounds respectively for Al Gharafa in the defeat. Defending champion maintains fifth place with 5-4 record. Al Gharafa at the other side keeps the sixth position with five games lost. The game in Doha was also worth to mention about. Fourth ranked Al Wakrah (6-3) played at the court of 7th ranked Al Ahli (2-7). Al Wakrah managed to secure a 5-point victory 73-68. Al Wakrah forced 19 Al Ahli turnovers. It was a good game for American point guard DaQuan Brooks (177-90, college: W.Connecticut) who led his team to a victory with 18 points, 6 rebounds and 7 assists. His fellow American import power forward Joshua Caldwell (203-91, college: William Penn, agency: SDJ Sports) contributed with 16 points, 7 rebounds and 4 assists for the winners. Caldwell is a former Eurobasket Summer League player, which is considered top international summer league in the market. Guamanian-American guard Earnest Ross (196-91, college: Missouri, agency: Haylett Sports) answered with a double-double by scoring 14 points, 11 rebounds, 6 assists and 5 steals and American power forward Kenny Hall (206-90, college: Tennessee) added 17 points and 12 rebounds in the effort for Al Ahli. Both teams had four players each who scored in double figures. Al Wakrah maintains fourth place with 6-3 record. Al Ahli lost their fifth game in a row. They keep the seventh position with seven games lost. Al Shamal Doha signed with the American point guard Jeff Newberry (188-G-92, college: Oklahoma St.) for GCC. Jeff is High level combo guard. Great athlete top defender and scorer.